What ASCEND is not, though, is cheap, so if you’re concerned about the price, I understand--you can get a brain supplement for a bit less. Remember that you get what you pay for, though, so generally speaking, the cheaper a supplement is, the less effective the formulation. Place your order now and if you don’t absolutely love ASCEND, just let us know and we’ll give you a full refund on the spot. No complicated forms and no return necessary. You really can’t lose, so order now and get ready to enjoy a healthier, happier, and higher-performing brain that allows you to think faster, focus deeper, and feel better. Alpha-Glycerophosphocholine (Alpha-GPC) is a compound that increases the activity of acetylcholine in the brain, which is a chemical used by nerves to communicate with each other (neurotransmitter). It isn’t gobbled up by the choline-loving liver and thus can reach the brain and act on it directly. It helps your body maintain sufficient levels of acetylcholine, which in turn supports optimal physical and mental performance. It provides your body with glycerophosphate, which is a substance in the membranes of nerve cells that supports brain health and function. Cytidine Diphosphate-Choline (CDP-Choline) is another compound that can reach the brain and provide it with choline—an essential nutrient for brain development and health—as well as a precursor to another vital nutrient, uridine.. 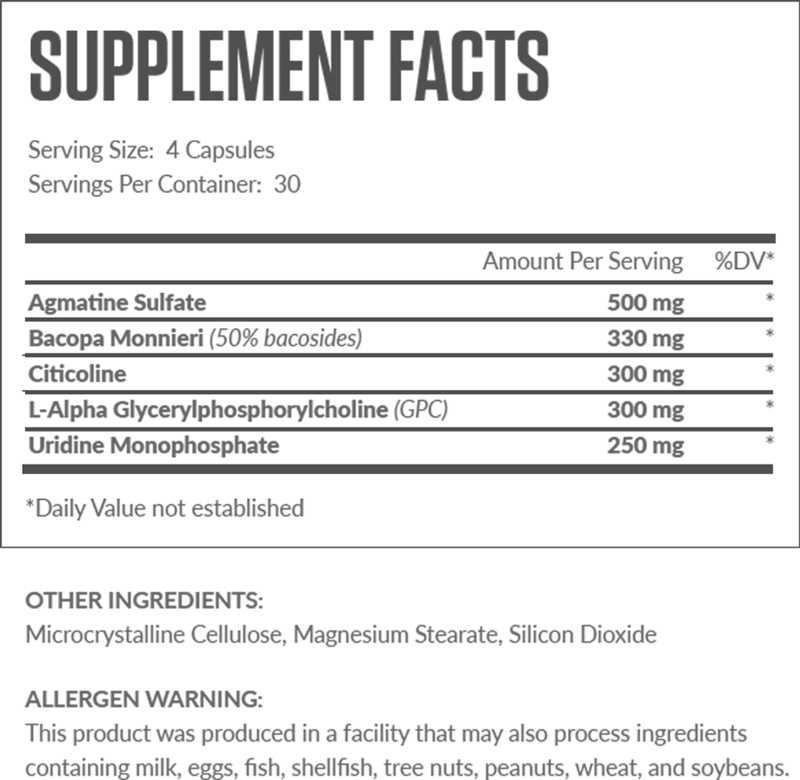 THE CLINICALLY EFFECTIVE DOSAGE OF CDP-CHOLINE IS BETWEEN 250 TO 500 MILLIGRAMS FOR FOCUS AND 500 TO 1,000 MILLIGRAMS FOR PREVENTING COGNITIVE DECLINE, AND ASCEND CONTAINS 300 MILLIGRAMS. It gets us to 600 milligrams of active acetylcholine-enhancing agents (Alpha-GPC being the other). Moreover, uridine monophosphate is uridine bound to a substance called phosphoric acid that helps the body create phosphatidylcholine, which is an essential building block for nerve cells (neurons). Thus, it's no surprise that, when supplemented, it can produce cognitive benefits in rodents, and we strongly believe that these effects will be replicated to some degree in humans as more research is done. THE CLINICALLY EFFECTIVE DOSAGE OF URIDINE HASN’T BEEN ESTABLISHED YET, BUT ASCEND CONTAINS 250 MILLIGRAMS AS IT’S THE HUMAN EQUIVALENT TO WHAT IS REQUIRED TO PRODUCE THE DESIRED EFFECTS IN ANIMAL RESEARCH. Bacopa monnieri is an herb that has long been used in traditional Ayurvedic medicine to treat various neurological health disorders and to aid memory. Modern science has discovered why: it contains bacosides, which are natural substances that stimulate the secretion of two types of brain growth factors (BDNF and NGF), which are chemicals in the brain that help neurons connect, grow, and proliferate. CLINICALLY EFFECTIVE DOSAGES OF BACOPA MONNIERI RANGE FROM 250 TO 300 MILLIGRAMS STANDARDIZED FOR 55% BACOSIDE CONTENT, AND ASCEND CONTAINS 330 MILLIGRAMS AT 50% BACOSIDES AS THIS IS THE LEVEL USED IN MANY CLINICAL TRIALS SHOWING EFFICACY. We’re partly relying on animal research with agmatine because while it lacks human studies for our purposes here, cognitive effects have been demonstrated in the rodent model and based on the human studies currently available, we believe they can likely be extrapolated to us, as well. 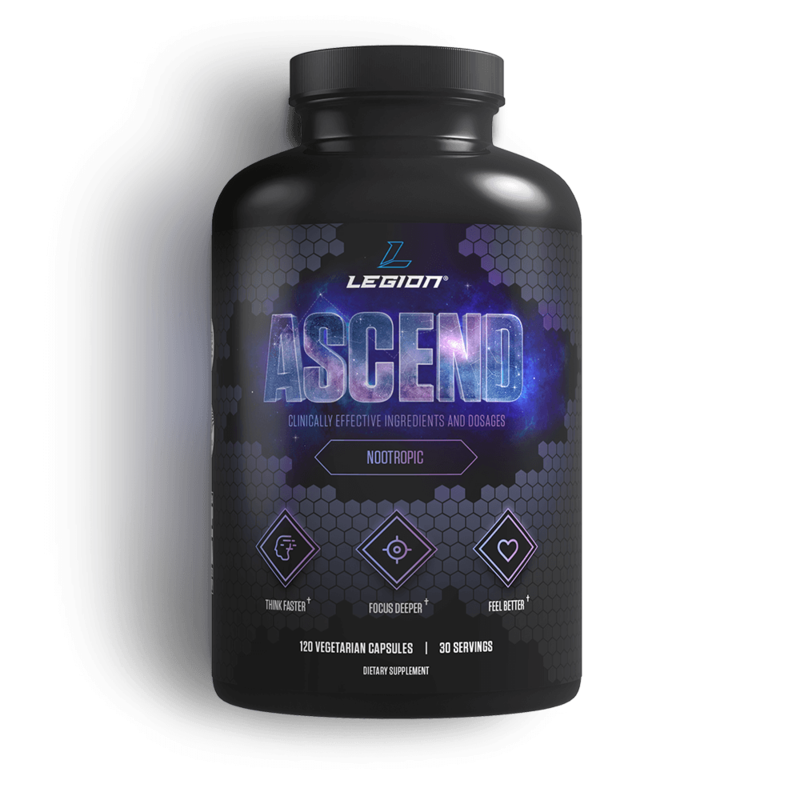 ASCEND CONTAINS 500 MILLIGRAMS OF AGMATINE, WHICH IS ENOUGH TO SAFELY REAP ITS COGNITIVE BENEFITS. To support cognitive health and performance, supplement with one serving of ASCEND every day, preferably with food. You can take a full serving all at once or split it into two equal doses taken several hours apart (we recommend that you try both ways and see which you like best).